Win it or bin it. 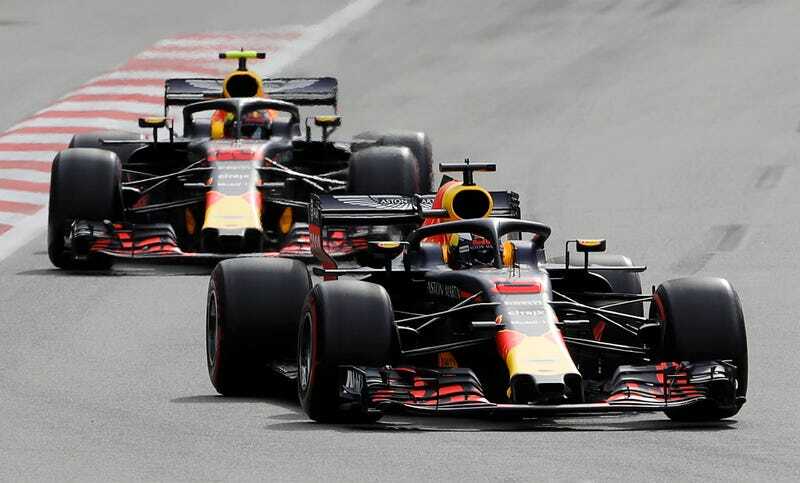 That’s apparently the Red Bull Formula One team’s motto, as Daniel Ricciardo and Max Verstappen have scored their second double-DNF in the first four races of the season. Ricciardo won two weeks ago in China, and was on a path toward a very nicely placed finish in Azerbaijan until he rear-ended his teammate on a deep-dive pass into the first turn that ended with both of them skidding up the escape road into retirement. The Red Bull pair had spent the entire Grand Prix leading up to their crash entangled in a battle for position, even reaching the point of banging wheels at the exit of the first turn. Ricciardo was visibly quicker than Verstappen at a few points on the track, but it took several laps for him to move ahead. Verstappen then re-took the point with a well-timed pit stop. Shortly, Ricciardo was back on the grind, getting within attack distance of Max. Then this happened. With a jink to the right, Ricciardo was setting up the inside pass on the left. Verstappen covered the right hand side, then came back right in front of Daniel. As he’d already committed to the deep-braking maneuver, there was no way for him to prevent the crash. Harder on the brakes in a panic, and his front wheels locked up, sliding him deep under Verstappen’s rear wing. This incident pretty much opened the door for Mercedes’ first win of the season, as Valtteri Bottas was promoted to the top spot. A lengthy caution period lasted eight laps of circulation for the rest of the field. The Red Bull incident was cleaned up relatively quickly, but the caution was extended when Romain Grosjean’s Haas Ferrari skidded into the wall after turn 13 while he was swerving to warm his tires. Unlucky. When the race got back to green, Bottas was in the lead and quickly opened up a gap to teammate Lewis Hamilton behind. At the end of that first lap following the safety car period, Bottas looked like he had everything in the bag, and only needed to run three more laps at the front to take the victory. As luck would have it, he struck debris on the main straight, presumably Red Bull debris, which punctured his right rear tire and scuppered any chance he might have had. World Champion Hamilton was promoted to his first win of the 2018 season, Kimi Raikkonnen to second, and Force India’s Checo Perez scored third to add 15 points to the team’s total (now 16 points). This was a good race from start to finish, and it might have been all the more exciting if Red Bull hadn’t thrown everything in the trash. This just proves our thesis from the most recent race, that you should definitely be watching F1 again. Update 12:15 p.m. Sunday: According to a report by Motorsport.com, both Red Bull drivers have been given team orders of sorts; to return directly to the Red Bull in Milton Keynes to personally deliver an apology to the staff for their incident that cost both team cars a finish of any kind. Team principal Christian Horner was not pleased, saying both drivers are in “the dog house” after ignoring mid-race orders to calm down.